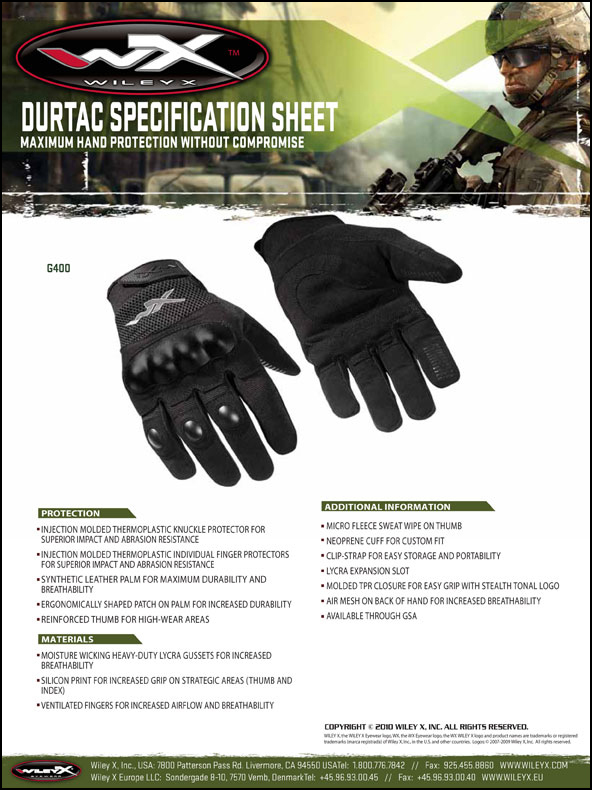 Wiley X DURTAC gloves offer users the most advanced protection in the field. This new glove features injection molded thermoplastic knuckle and individual finger protectors for superior impact and abrasion resistance. The advanced design also includes a synthetic leather palm for maximum durability and breathability, together with an ergonomically shaped palm patch. A reinforced thumb provides added durability for this high-wear area. 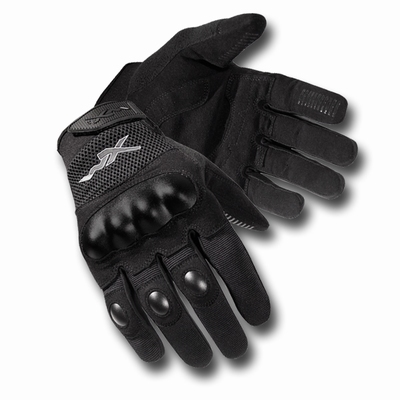 The Wiley X DURTAC glove features heavy-duty Lycra gussets that wick away moisture for enhanced breathability and comfort. 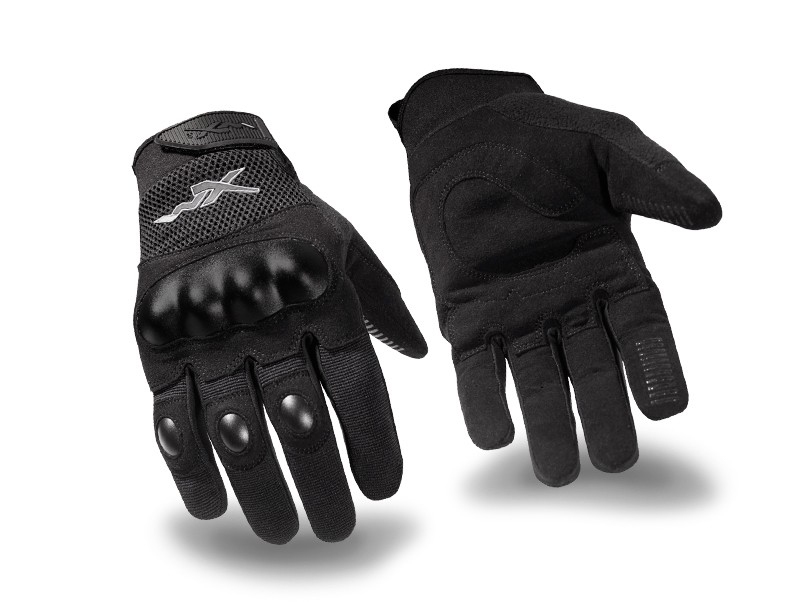 The design also features ventilated fingers and an Air Mesh on the back of the hand to increase airflow, reduce moisture and improve wearing comfort in the most challenging environments. Most importantly, Wiley X adds a silicone print on the thumb and index fingers, for increased grip where it matters most and superior weapon control. This glove has been specially designed to meet the demanding needs of field use, with a neoprene cuff for a custom fit and a molded, easy-grip TPR closure that keeps out dust and debris. Other important features include a Lycra expansion slot and a durable clip strap for easy storage and portability. A unique Micro Fleece sweat wipe on each thumb makes it easy to dry one's brow in the heat of action. Injection molded thermoplastic knuckle protector for superior impact and abrasion resistance. Injection molded thermoplastic individual finger protectors for superior impact and abrasion resistance. Synthetic leather palm for maximum durability and breathability. Ergonomically shaped patch on palm for increased durability. Reinforced thumb for high-wear areas. Moisture wicking heavy-duty lycra gussets for increased breathability.